The RiSE Center packs chopsticks, batteries, goggles, salt, calculators, golf balls, maple syrup, Matchbox cars, measuring tape and more in tubs for hands-on experiments. 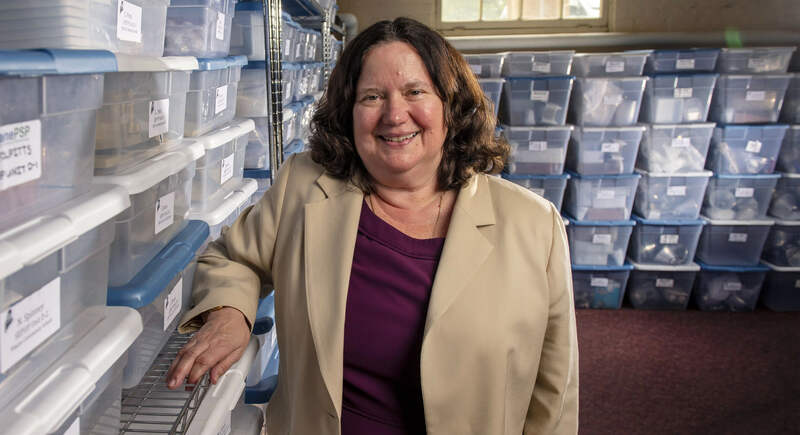 In 2001, with a $1,233,000 grant from the U.S. Department of Education, University of Maine physicist Susan McKay founded the Maine Center for Research in STEM Education (RiSE Center). Its mission: To advance the research and practice of teaching and learning in science, technology, engineering, and mathematics. Today, McKay, 18 other professors, seven professional staff members and 30 graduate students spanning four colleges and 10 STEM departments take a comprehensive approach to accomplish the mission. In the last eight years, the RiSE Center has secured grants totaling more than $19 million to work with teachers to infuse classrooms with research-supported practices. A portion has gone to enhance educators’ professional development. Also during that span, 2,518 elementary, middle and high school teachers — from the border of Canada to the border of New Hampshire — have attended RiSE professional learning opportunities. A goal is workforce development in Maine, including in engineering and health care professions that require a strong background in STEM. Supporting teachers — from preK through graduate school — is a way to accomplish that goal, she says. STEM fields also are natural places to learn fundamental analytical-reasoning skills that are key to navigating the world and having an informed perspective. From 2010–2014 — the first 4 years of RiSE programming — in schools where teachers participated in the center’s programs, the % of 8th-graders meeting or exceeding proficiency on the MEA for science improved from 71.4 to 80.1%. The numerous academic disciplines represented at the center is a unique strength, McKay says. Faculty pursue education research in their respective fields — astronomy, biology, ecology, chemistry, Earth science, marine science, mathematics, physics and watershed biogeochemistry — as well as research across disciplines. RiSE faculty study the teaching and learning of STEM, often with a focus on concepts or practices that are specific to a discipline, from elementary school through college. The overall focus of the center’s research is on understanding and improving the quality of STEM education. at all levels of instruction. The center also works at the university level to support research-based improvements to STEM instruction. More than 300 educators, including university faculty, teaching assistants, and undergraduate learning assistants, have participated in RiSE professional learning opportunities and STEM education improvement programs. The center aims to make it easier for teachers in more than 200 Maine classrooms to engage students in science using a variety of strategies, including hands-on materials and active learning. Thus, the center provides teachers with access to large tubs with abundant materials — from golf balls to maple syrup and from goggles and calculators to potting soil, Matchbox cars and measuring tape. Schools pay $15 per student per year for the lot. Particularly important, RiSE provides coordinated professional learning for teachers using these materials, including sessions for those teachers who are new to them. The RiSE Center also provides schools with 3D printers, and assists educators with incorporating the cutting-edge technology into standards-aligned lessons. Each fall, recent graduates of the center’s Master of Science in Teaching (MST) program begin careers in classrooms around the Pine Tree state — including in high-need rural areas. In addition to being equipped with science content knowledge they have a thorough understanding of proven teaching techniques. The RiSE Center provides all students the chance to play in the science space, says founding director Susan McKay. MST graduate Marina Van der Eb opted for a slightly different route — she’s the Maine STEM Partnership Coordinator. The Brooksville, Maine native organizes professional learning opportunities and instructional resources for preK–16+ teachers. She says it’s particularly rewarding to bolster educators who don’t have extensive backgrounds in science who, for budgetary or other reasons, have been assigned to teach STEM courses. Van der Eb’s master’s thesis focused on improving student engagement by making science classroom experiences more relevant to their lives. She developed a place-based unit for coastal schools about ocean surface currents and how changes in ocean temperature impact the lobster industry. And in schools where teachers participate in RiSE programs, the percentage of eighth-graders meeting or exceeding proficiency on the MEA for science improved incrementally from 71.4 percent in 2010 to 80.1 percent in 2014, during the first four years of the center’s programming. By comparison, during the same period, schools that haven’t yet had teachers take part in RiSE programs improved from 71.4 percent of students meeting or exceeding proficiency, to 72.3 percent. “Our schools improved proficiency by about 8 percent, meaning that for every 100 students tested, an additional eight students met or exceeded proficiency,” says Laura Millay, the center’s research and evaluation coordinator. “About 12,500 students are tested per year, so if all Maine students had access to this programming, we would expect about 1,000 more of them to meet/exceed proficiency on the MEA Grade 8 science test than they would without the programming,” says Millay. The center regularly examines its data and assesses its programs in order to provide Maine youth with the most effective research-supported strategies to learn in the science space. Well-respected researchers with the center have done much to explore and document best practices. In the past year, 19 faculty and 30-plus graduate students have had 20 journal articles and conference proceedings published or accepted for publication. They’ve also taken part in 120 research presentations at national and international conferences and forums. McKay also has good reason to be excited about the future. The center recently was awarded a $1.25 million grant from the National Science Foundation to integrate computing into the middle school science curriculum. This initiative takes advantage of the knowledgeable and committed community of Maine STEM Partnership middle school science teachers and UMaine faculty. It will help build a foundation in the use of computing to do science for all students and contribute to knowledge about how to best make this change nationally in the way we teach science. McKay sees the community of the Maine STEM Partnership, which integrates research findings into practice, as key to future improvements in STEM teaching and learning. “The center’s work to integrate research and practice models one way that a land grant university can benefit and involve the state,” she says. “RiSE partnerships have improved education and workforce development. They’ve also provided the infrastructure and capacity to continue improving. The center, a leader in STEM education research, demonstrates how to partner with school districts and others to bring funding to Maine for ongoing improvements guided by research into persistent problems and needs in STEM education.